V-Bottoms are interesting. I've never ridden one I liked. Discussion in 'Surfing' started by SMUKES, Jun 11, 2012. Ekstrom's quote on V bottoms is: Yeah, I'll make you one, but you're gonna hate me in six months. A failed experiment that only worked when the tail was cut into a swallow, ala the Mirandon brothers. Still, this is one of the nicer Vs from that era. A turd with a fin attached. A brief part of the "transition". Gone in the blink of an eye. But they did serve their intended purpose; putting the board on rail. I wouldn't say a turd, I was so fortunate to be at Rincon in 1967 when McTavish and Bigler came straight from the airport with their new V bottoms. I knew right then surfing had changed forever, as soon as I got back to Surfboards East in NJ., I told them, "stop the presses". I first built an 8'1", thin rails, deep V like Big Mac's, Greenough 3 fin, I had so many raging sessions on the ones I shaped for myself, L jetty well overhead, driving as far into the bottom as possible and cranking it off the bottom into stand up tubes, Trestles at Matunuck, bottom turns into wrap around cut backs all summer long in '68. Where does the vee start, how far ahead of the leading edge of the fin Jim? Such a different trip from my single to double concaves... The Mirandon point was what I found interesting, though I have to say the board pictured would work no differently with a swallow I think. Also, if vee is so great, why are all hi-pro shortboards completely flat or slightly concave? What was the vee supposed to do? Also, if vee is so great, why are all hi-pro shortboards completely flat or slightly concave? Is this a true statement? I don't keep up with the latest whipper snapper trends, but a quick visit to the Channel Islands website would seem to indicate that vee is still alive and well in the modern hi-pro thruster world. I have a love for V-bottoms ever since I first saw one propped up in the corner of a surf shop collecting dust. I was like" "WHAT is THAT?" I had to have one. Loved the wide tail & just the asthetic of them. I had no idea how they'd go in the water. Now I have owned a couple and still have them. I love the history of them, knowing they came from approx 1968-69 and have over 40 years of waves under their belt and are still going stong. They are also quite hard to stumble on because their heyday was so short-lived, so if you find one for sale I feel like it's a bit of a rare gem - despite how they perform. It's like stepping back in time when you ride them. Mine always starts a conversation in the line up when i take it out - which admittedly isn't all that often. The old boards are pretty heavy and they definitely take some getting used to. My 8'6" catches waves super easily, but when I go to turn, it's so different than my everyday rider that I usually look pretty kooky at first. I think if this were my only board & I rode it every day I would rip on this baby. But it's really just a 'special occasion' board for me. Slight vee... Super slight Colin. I meant the exaggerated vee. Here is my daily driver if I am not hulling. 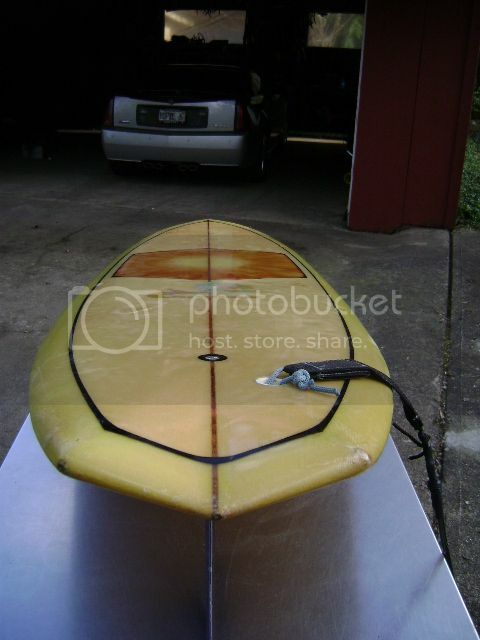 This board has bladed/ pinched rails, low rocker and lot's of "V" forward and rear of fin. Carves turns, pumps for acceleration and nose rides. It likes Malibu 1st point and beach breaks in Manhattan Beach, Calif. I recently purchased a 7'6" Hansen Derringer. I've only ridden it a few times but it was stable and turned well. I liked it. I have always wanted one since 1969. I think they are a trip and definately a step back in time. Which I like. That's a big 10-4 tentoesed! I love my V2. I'd like to have one under 9ft...mine is somewhere around 9'2''. I'm a strong proponent of the design. I'm ashamed to say that mine has been on the shelf of late, as I've been playing with my newly acquired Tyler Riddler. I'm going to pull that V2 out this week for sure.